Hi Chris and all our readers! It feels like an eternity since I last sent you word from Philly!! Life has been focused on many other things, and I sadly had to put my blogging fingers and gardening gloves to one side! I guess you all know what it feels like! It has been raining alot and the garden is soaked and muddy too! But, even though it seems like the same old flowers and trees blooming and budding, I did look at them with a new eye and there…..I found something new and I’m excited…..yea!! It is my Fuchsia bush. I love this beautiful bush that hugs my roses. There are currently almost 110 recognized species of Fuchsia, so I do not have a clue which one I have. I will send a photo of the flowers as soon as they bloom! Enjoy your garden today! I know that the rain will bring new life and that something will make you smile! Glad you are back! It’s been pouring and storming here too so haven’t been able to do a thing outside. 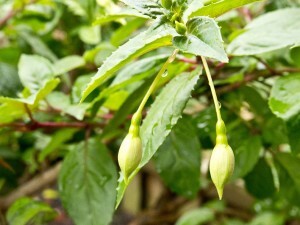 The fuchsias look lovely, can’t wait to see them flower!!! So glad to be back! Yes, me too! Glad you are back to blogging! I love fuschias and have some very very pink ones in the garden, which clash violently with the orange montbretia when they are both out. Looking forward to seeing more of your garden. Also please send us some of your rain! Hi Ronnie, thank you for “missing” me I love when there is a clash and splash of colours – the way nature intended it! Pink and orange! We have had buckets of rain, so I can’t work in the garden, but I promise to post some photos of whats growing. By the way, I love the gardens at Upwaltham Barns.